The origins of The Gunstringer are not what most people would expect. At Comic-Con in San Diego, TwistedPixel CEO Michael Wilford let us in on the story that has already spread throughout the internet that the pitch for the game came about during the time span of a bathroom break. After talking to TwistedPixel about the Kinect technology, Microsoft executives went to the bathroom. Michael and one of the other’s on his team looked at a skeleton marionette on the wall of the Mexican restaurant they were at and came up with the pitch by the time the Microsoft suits had returned. The rest, as they say, is history. At first, the Gunstring appears as a fairly simple concept. Players use one hand to control the motion of the character left, right or jumping while their other hand aims an imaginary gun at up to six targets. Players fire by lifting their right hand quickly just like they would back in the childhood days of playing cowboys and Indians or cops and robbers. There is something to be said for the immediate nostalgia brought to this game with that one simple action. Not only does it have a control that is intuitive to the Kinect sensor for the action it represents, but it brings people back to their childhood which makes it almost impossible not to like. Whether its ninjas, ducks, cowboys or Indians, everything in the Old West wants to take out the Gunstringer and the player needs to be able to shoot it out before it gets to him or at least get out of the way. You have to hand it to Quentin Tarantino. Besides being a very talented director who tells interesting stories well he’s also got the ability to put together some great ensemble casts. From his fist film Reservoir Dogs, through his most recent Inglorious Basterds, the director never ceases to lock in some great actors for his films. 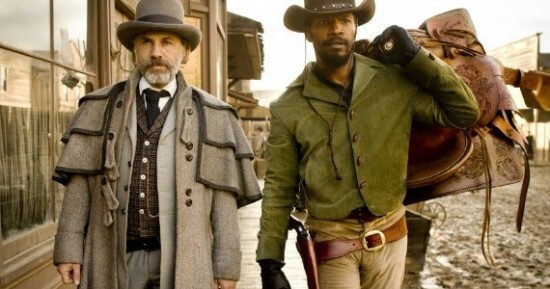 He’s continuing that trend with his upcoming Sergio Leone-inspired western Django Unchained. He’s already got Jamie Foxx, Christoph Waltz, Samuel L. Jackson and Leonardo DiCaprio. Now, according to Deadline, we can add Oscar-winner Kevin Costner to the mix as well. According to the report, Costner would play Ace Woody, “the sadistic trainer of the male fighting slaves who entertain the white patrons of Candyland as well as the female slaves who are forced to be prostitutes. The club and ranch are owned by Calvin Candie (DiCaprio) and Ace Woody is the one who pits the “mandingo” fighters against one another.” Sounds like a nice guy. Mmm, not. Once Coster is set for the role he and DiCaprio should make an interesting pair of bad guys. I’m sure it will be very interesting to see how it all turns out. The film is set to go into production in the Fall with an eye to a late 2012 release. We’ll bring you more on this film as we get it. Quentin Tarantino will be making time during the pre-production of his upcoming western, Django Unchained, to appear in a film from legendary spaghetti western star Franco Nero. Before the announcement of what Tarantino’s next project would be, we heard rumors that he would be working with Nero on his next project. Most assumed once Tarantino’s western was announced, that Nero would be involved in this film. Many were surprised that once the cast for Django Unchained had been announced, including names like Jamie Foxx, Leonardo DiCaprio, Christoph Waltz and Samuel L. Jackson, that Nero’s name wasn’t among them. It seems the rumors were true and they will be working together, just not on Django. According to Nero, Tarantino has agreed to make an appearance in the actor’s upcoming film The Angel, The Brute and The Wise. So now, instead of Nero acting in a Tarantino’s film, we’ll get Tarantino acting in Nero’s. It seems it is Nero’s lucky day, as he gets a cameo from not only Tarantino, but he also get Robert Rodriguez and some of Tarantino’s other celebrity friends. Even though Tarantino’s role is more of an extended cameo than a co-starring role, Nero will undoubtedly have to accommodate Tarantino and his friends when it comes to production.